Cook ground round and onion in large skillet, stirring until beef crumbles and is no longer pink; drain meat, and return to skillet. Stir pasta sauce into beef mixture. Melt butter in a saucepan over medium-low heat; whisk in flour until smooth. Cook 1 minute, whisking constantly. Gradually whisk in milk; cook over medium heat, whisking constantly 8 minutes or until mixture is thickened and bubbly. Remove from heat, and stir in 1/2 cup Parmesan cheese and pepper. Spoon one-third of meat mixture into lightly greased 5 quart slow cooker. Spread half of broken spaghetti over meat, pour half of white sauce over noodles, and sprinkle with 1 cup Cheddar cheese. Repeat layers once. Spread remaining meat mixture over cheese. Top with remaining 1 cup Cheddar cheese. Cover and cook on Low 4 hours. Let stand 10 minutes before serving. Serve with Parmesan cheese. Makes 6-8 servings. Fold a 30-inch long piece of foil in half lengthwise. Place in bottom of a slow cooker with both ends hanging over top edge of cooker. I also put a piece of crumpled foil in the bottom to keep the meatloaf out of the fat. The foil strip will make it much easier to remove the meatloaf when it's done. In a large bowl, mix ground beef with bread crumbs, 1/2 cup spaghetti sauce, egg, onion, salt, garlic powder, Italian herbs, and pepper until well blended. Shape into a loaf. Place in slow cooker. Spread 3 tablespoons spaghetti sauce over the loaf. Cover and cook on HIGH for 2 1/2 to 3 hours or on LOW for 5 to 6 hours, or until juices run clear. Top loaf with cheese slices, overlapping, and continue to cook (turn to HIGH if necessary) for 15 to 25 minutes longer. Use ends of foil to lift out meat loaf and transfer to a serving platter. Brown together onion, garlic, and ground beef in a heavy skillet. Drain any excess fat. Add pepper, ketchup, mustard, and flour to skillet and cook and stir for 3 minutes. Turn this meat mixture into the pie crust lined pan. 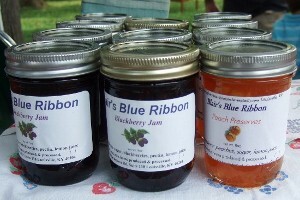 Blair's Blue Ribbon Jams and Jellies took FIVE BLUE RIBBONS at the Kentucky State Fair and one second place ribbon for a total of SIX! If you've tried them you know why - they are delicious. Stop by her booth and ask her who won the first place to her second - the answer will make you laugh! 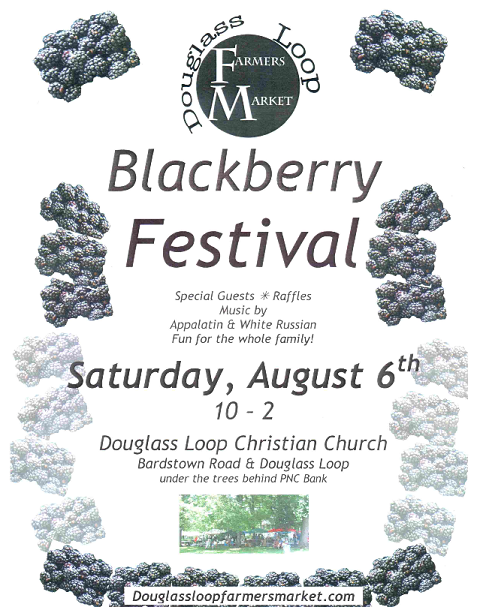 Blackberry Festival a big success! Welcome to Grannys Delights, your source for old fashioned home made quality products including potato bread, potato bread rolls, fruit breads, the very finest in vegetables as well as all types of canned items. We developed our products after many years of serving these items to our friends and family. We had always shared the bounty of our garden with family and then started selling the excess at our local farmers market. We realized how much we enjoyed this and continued to expand. Finally we decided to do this full time. We obtained our home based processor license as well as our home based microprocessor licensed as required by the Commonwealth of Kentucky. We are definitely a family organization as our grown children help us in this venture. Our summer is a busy time with 16 hours days, six days a week. We always reserve Sunday for a time of worship, family and some relaxation. Winter is a little more relaxed with time spent planning for the upcoming busy season and experimenting with some new recipes. 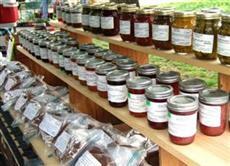 We sell our products at farmers markets here in Kentucky. Under the terms of our current licenses with the Commonwealth of Kentucky we are only allowed to sell our products at farmers markets, on our premises or at certified roadside stands. Later we may continue to expand by obtaining a necessary licenses in order to sell our products over the internet. While we may not ship our produts out of state, you can certainly order our products and then pick them up at one of our markets. 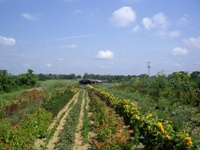 Hazelfield Farm is a small diversified family farm located in Wheatley, Kentucky. We are Certified Naturally Grown. We specialize in cut flowers, heirloom vegetables, herbs, potted plants, and fresh cut holiday greenery. Wedding and party florals are our specialty, using only our fresh Kentucky grown flowers. Our farming crew consists of husband and wife team Raphe Ellis and Teresa Biagi, and their children. We are dedicated to providing gourmet produce using all-natural practices without the use of chemical fertilizers or pesticides. Hazelfield Farm can be found at the Douglass Loop Farmers Market in Louisville, the Frankfort Farmers' Market and the Hyde Park Farmers' Market in Cincinnati. The Herb Shack is located in Louisville, KY. I offer premium herb starts grown in organic potting soil and biodegradable pots making it healthier for you and the environment. Although I am not certified organic, I do use organic growing practices in my greenhouse. I purchase high quality seeds that are certified organic or are heirloom seeds that have not been treated nor genetically modified. I am proud to sell high quality herblets that will grow well in your garden with normal care. Limbwalker Tree Service is a team of certified arborists and plant care specialists. Our mission is to provide the highest quality tree care, utilizing the most current information and techniques. Our Certified Arborists continually update their education to maintain certification by the International Society of Arboriculture (ISA). Here at Limbwalker, we believe that the best way to improve the health of your plants is to improve the health of your soils. Bio-TeaTM is a compost tea brewed daily at Limbwalker Headquarters. Bio-TeaTM is a nutritional, biological, insect and disease treatment all in one liquid form. We combine organic ingredients such as compost, kelp, humates, fish proteins, worm castings, and sugars to create a living fertilizer that improves your soil's health. Bio-Tea naturally increases biological activity in the soil and improves soil structure, allowing your plants to receive the essential nutrients they need to grow strong, healthy roots. This organic root-zone fertilization system is a healthy "drink" for flower and vegetable gardens, trees, lawns and even houseplants. Stop by our booth to learn more.